Three members of the Stock Exchange. Six Stock Market Brokers or Chairmen/Vice-Chairmen of Brokerage Firms. Six directors of corporations having equities, corporate bond, or trust instruments admitted to listing by the Stock Exchange. Six members of the Stock Exchange holding securities investments. Six dealers in markets operating within the Stock Exchange. One foreign-exchange broker or institutional foreign-exchange agent, one auctioneer, and one insurance agent or insurance broker. One cattle breeder, one grain grower, and one consignment agent. One importer, one exporter, and one carrier or customs clearer. (*) At the Annual General Meeting, 48 alternate Council Members are also elected, who will take office in case of death, disability, or resignation of any regular Council Member. 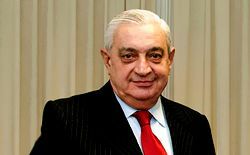 Likewise, the Chairmen of the 26 affiliates to the Stock Exchange (including the Chairman of Mercado de Valores de Buenos Aires S.A.) are an integral part of the Exchange Council Board. See Mercado de Valores S.A. The origin of the Bolsa de Comercio de Buenos Aires dates back to Spanish colonial times, when the first local residents started making efforts to generate business activities. One of such endeavors was the establishment of the Bolsa de Comercio de Buenos Aires on July 10, 1854. Gathered at the premises of the first Exchange, a house owned by the family of General José de San Martín, merchants executed transactions in gold ounces. This activity gave rise to the creation of this new Institution and, despite some interruptions, continued to be the main line of business up until the 1890 crisis. It should be noted that by 1856 corporate shares began to be traded on the Exchange. 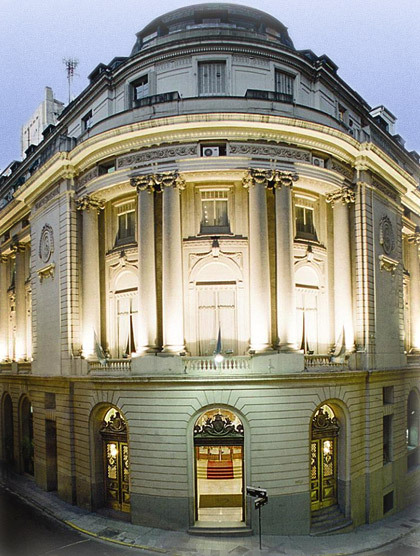 As a result of an increase in the number of trades and members, on January 28, 1862, and with the presence of Buenos Aires Province Governor Bartolome Mitre, the Institution opened the first proprietary building, which today serves as an annex to the Central Bank of Argentina. Gold, mortgage bonds, foreign exchange, Banco Nacional shares, and other securities were traded within its premises. Twenty years after its inauguration, such facilities were insufficient for trading. Therefore, the Exchange purchased land across the Government House and put up a third building, where trading began in 1885. Today, this place is the main access to the Bank of the Argentine Nation. Another landmark in the history of the securities industry in Argentina was the enactment of the Securities Public Offering Law No.17811 in1968. This statute provided for the creation of the National Securities Commission (CNV), and it granted self-regulatory powers to domestic stock exchanges and securities markets. Throughout the 1990s, the Exchange became the leading institution which enabled small and large investors to own an equity ownership interest in the big utilities companies that were admitted to listing after being privatized. In 2000, the Institution bailed out the country once again with the rescheduling of its public and private debt. Thanks to compliance with its financial commitments in due time and manner, and despite the changing rules of the game during the last crisis, the Exchange managed to preserve its institutional reliability. Celebrating its 160º anniversary, Buenos Aires Stock Exchange is pleased to receive presidents of exchanges and markets of the region, in opportunity of the 41º General Assembly of the Iberoamerican Federation of Exchanges, in September 2014. Latin-American Economic Research Foundation (FIEL). Argentine Committee of the International Chamber of Commerce – ICC. Argentine Foundation for the Eradication of Foot and Mouth Disease (FADEFA). Bolsa de San Pablo (1) – 12/17/91 – Mutual information sharing and interconnected communications systems to facilitate transactions between both marketplaces. Bolsa de Río de Janeiro (1) – 05/05/92 – Mutual information sharing and interconnected communications systems to facilitate transactions between both marketplaces. Bolsa de Santiago – 05/21/92 – Mutual information sharing and interconnected communications systems to facilitate transactions between both marketplaces. Bolsa de Occidente (2) – 06/19/92 – Letter of intent to cooperate in modernizing the respective markets through the provision of surveys and advice, and to promote linkage between both marketplaces with mutual information sharing and interconnected communications systems. NYSE – 07/23/92 – Information sharing for market surveillance. Amex – 08/07/92 – Information sharing for market surveillance. CBOE (Chicago Board Options Exchange) – 08/26/92 – Information sharing for market surveillance. Bolsa de Barcelona (3) – 09/22/92 – Letter of Intent to cooperate in modernizing the respective markets through the provision of surveys and advice, and to promote linkage between both marketplaces with mutual information sharing and interconnected communications systems. Bolsa de Bilbao (3) - 04/01/93 – Mutual information sharing and interconnected communications systems to favor interaction and expansion of both markets within their respective environments and geographic areas of dominant influence. Bolsa de Montevideo - 04/01/93 – Letter of Intent to share information and interconnected communications systems to provide information. Bolsa de Bogotá (2) – 04/26/93 – Mutual information sharing and interconnected communications systems to provide information. Bolsa de Lima – Mutual information sharing and interconnected communications systems to provide information. Caja de Valores S.A.(CVSA) and Servicio de Compensación y Liquidación de Valores S.A. (SCLV) (4) – 11/18/99 – Agreement to provide mutual securities clearing, settlement and custody services. LSE (London Stock Exchange) – 04/13/00 – Long-term Memorandum of Cooperation to facilitate the development of communications channels, to encourage an ongoing relationship between the parties, and to cooperate in maintaining orderly securities markets in each State. Caja de Valores S.A. (CVSA) and Compañía Brasilera de Liquidación y Custodia (CBLC) – 07/15/04 – Operational Agreement to provide mutual securities clearing, settlement and custody services. At present, a member of BMF&BOVESPA. At present, a member of Bolsa de Valores de Colombia. At present, a member of BME (Bolsas y Mercados Españoles). At present, IBERCLEAR has undertaken the functions and activities that used to be performed by SCLV.